Choosing portable antivirus – ClamWin Vs CureIt! Try to kill installed antivirus. Solution to this comes in the form of portable antivirus scanners. They don’t have background monitor function and need no installation. They are often freeware trimmed down versions of commercial products. This scanner is portable (via PortableApps) version of ClamWin. Which is Windows version of freeware and open-source ClamAV antivirus. Which is rather famous (mostly for being freeware and open-source). It comes as setup executable that must be installed once to get it portable and running. Virus definitions not included and are downloaded (and updated) by program internally. There is no default action on launch – you get interface with few simple buttons for updating, scanning computer memory, scanning specific drives and folders. Plenty of deeper options are available in "Preferences" like exclusions, logs and generating email notifications. Default setting are to report viruses only and skip certain files like logs and big archives. By default logs are written to program directory. 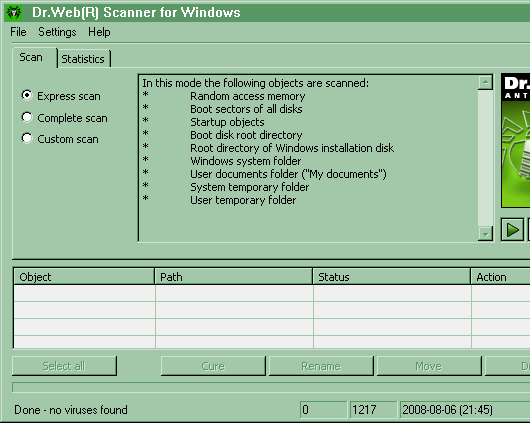 This scanner is freeware version of commercial DrWeb antivirus. It comes as single executable which is self-extracting archive that unpacks to Windows temporary directory and launches scanner. Virus definitions are included (always most recent). There is no option to update them – for that you must re-download scanner. On launch you get small nag screen and option to choose interface language (over 30 available and it tries to start with one that fits Windows regional settings). If download is not fresh it notifies how old it is and suggests to re-download. After that "Express scan" is launched which goes through memory and some usual places for viruses to nest (see screenshot above for complete description). Interface is slim but offers more explanations and info than ClamWin. In addition to manual targets choosing there is "Complete scan" that simply goes through everything on PC. Less settings than ClamWin has. By default there are some archives (detected by extension) skipped and log is written to current user’s profile directory. I’ve not used CureIt! I have used ClamWin, but not as a portable app. I think I need to add both to my toolbox since I do computer support for a living. Yep, these are good addition to toolbox. :) I wonder why antivirus developers are not very focused on portable versions. Lots of portable in this field are cracked and modified versrions of commercial products – shows people are interested. Still very few Like DrWeb (CureIt) and PortableApps (ClamWin Portable) do it properly. I use Dr. Web all of the time, love it. another one that i came across is Norman Malware cleaner. Thanks for suggestion, will check it out. :) Don’t think I heard much about Norman products. I have CA installed on my desktop and I love it but i am wondering if these will work as a backup plan just incase of a freak accident. anyone ever try these with CA or any other type of antivirus software installed on a PC? In general AV product don’t play well with each other. They use driver-based and other techniques to ensure they have low level access to stuff. Portable ones are less likely to cause issues (lack of background monitor module) but still I would advise against different AV products at the same time. You can always pause/disable your main antivirus if you want to do a scan with portable one. I have used the Cureit! earlier and i’m satisfied with it’s ability to scan and detect the virus.It’s really user friendly and every one can use it with ease. Used both: ClamWin since 2001 and Dr.Web later. For me Dr.Web is much better than ClamWin. ClamWin’s super duper SLOW Scanning speed is biggest letdown. I know it’s nit-picking for something free but well, that’s the bloody truth.